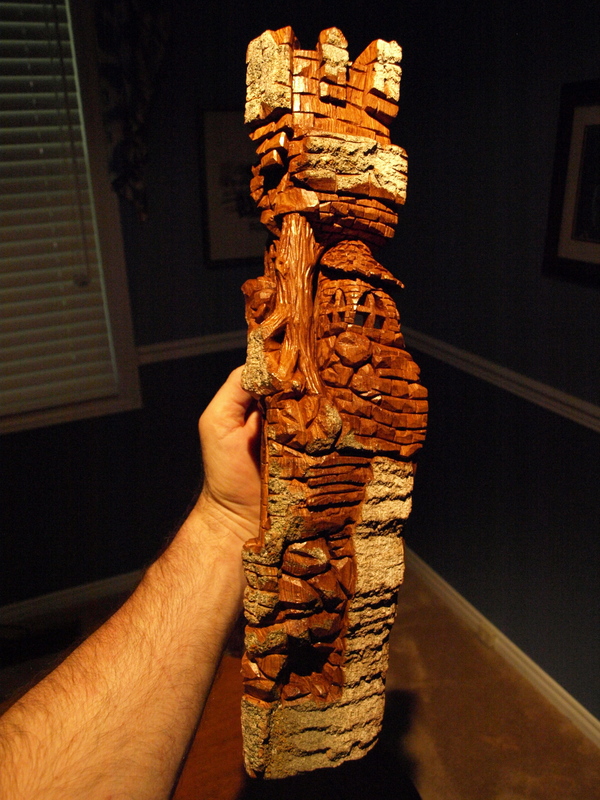 I took a break from gardening and put some time into a new bark carving. Actually, considering what I was doing as gardening is actually being kind…it was more like digging holes. So the carving has been a nice break. Now back to the hole digging, I mean, gardening. Just click on the photo to make it bigger. Following that, I added a few more accents. A new lower door came into play. Because the bark was a little indented at this point, the door is now cut further into the bark and looks a bit recessed. I also extended the brick work and added a few larger blocks beneath them for support. Wouldn’t want all of those bricks falling apart for lack of a good foundation! And that pretty much brings me to the end of the carving portion of this project. I want to touch up a few pieces and use some sandpaper on the insides of the windows to take away any remaining fuzzy parts…and then it’s time to apply a urethane finish. Here’s the start to a bark lighthouse based loosely on a famous lighthouse found at Martha’s Vineyard. Known as the Gay Head Lighthouse, it’s famous in that it was moved intact from it’s location in 2015. You can google it and you’ll find that it’s an interesting story. 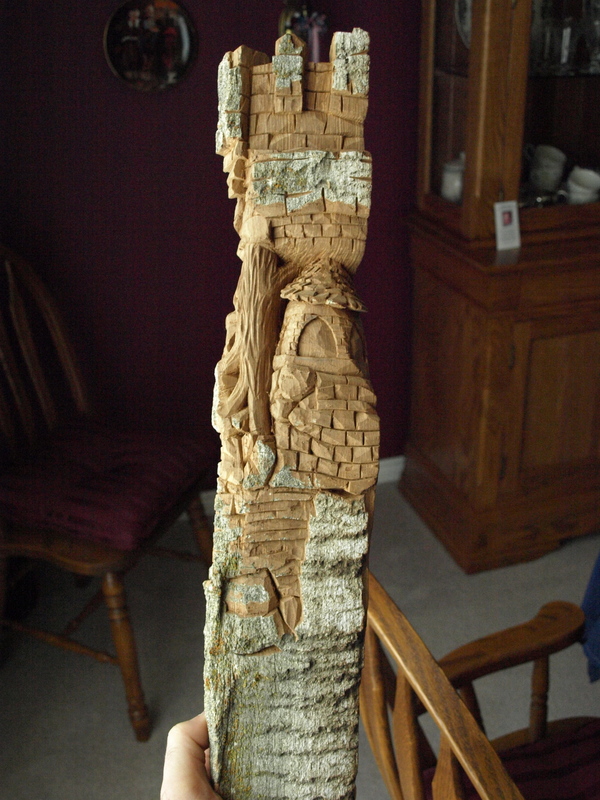 The bark is from a Cottonwood tree near Kingston. This climate produces a thinner and darker version of the bark than that which you would see from the west coast. 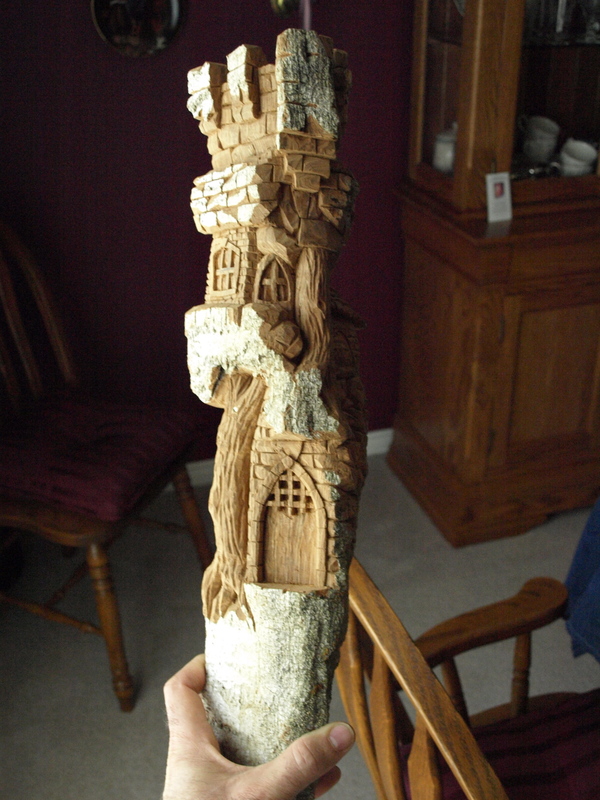 You might recall that the lighthouse that I made for Peggy’s uncle some time ago was made from the same tree. Here’s where it starts…looking hard at a piece of bark to try to see a lighthouse in it! Can you see it? How about a lighthouse with a little shed-like shelter at the base? See it now? The lighthouse that I’m carving has a very large glassed section with a similar sized level below it and then a final base that’s about 2 1/2 times longer than the upper levels. I’m using a bit of creative licence to add the little shed and I’m going to add some cedar shingled roofs and larger, aged bricks just because they look really good in a bark carving. Here’s the first roughing-in. Although you want to be very close to a vacuum system, I like to use a Foredom tool and Typhoon bit to do the initial shaping. It’s quick and it’s easy on the bark. Then with a couple of knives and a gouge, I added a bit of detail to start getting the dimensions right. If you have tried bark carving, you’ll know that it doesn’t carve like a block of wood. The only way that I can describe it is to imagine that you’re carving a softwood that has some qualities of cork. The knife or gouge isn’t quite pushed or pulled through the material…it’s more like a shearing action where you slide the knife along as you push or pull. Now you can see where that shed is going to go, right? Of course, before it’s finished, all of that glass area and windows / doors will be hollowed out. I like to keep that to the last so that the bark is as strong as possible while I’m carving so I don’t run the risk of damaging anything. We’re back from a quick vacation in Nova Scotia where we had a wonderful time and ate far too much seafood. And now that I’m home, I had to continue working through the Cottonwood bark that I have on stock. 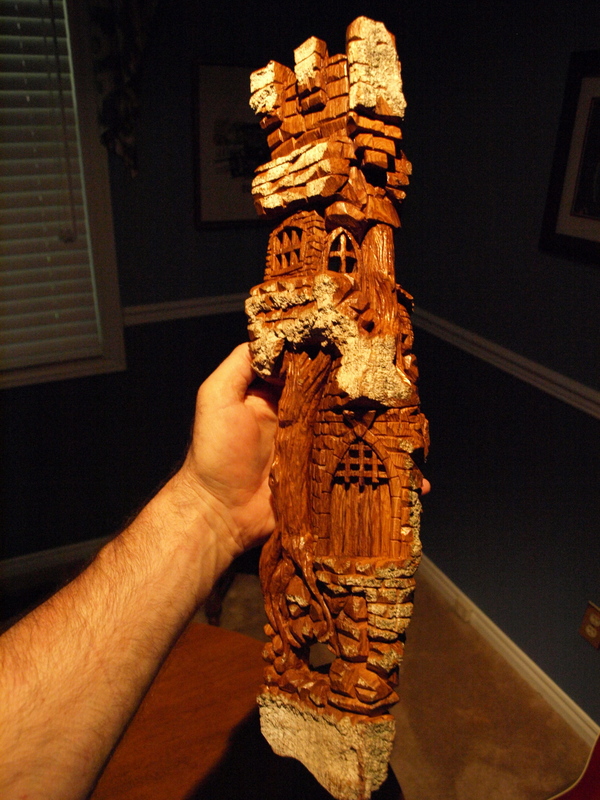 Here’s a little treehouse with the tree trunk winding under and through the little dwelling. Happy Canada Day!…149 years old and counting. I made this treehouse for my friends who picked up all of the Cottonwood bark from their cottage property for me. This particular piece had a nice split nature to it and I thought it would give it a nice look. These little carvings come together pretty quickly and I really should have had my camera at the ready to capture of few more “in progress” shots. I left a bit more bark than I usually do and I think that it really enhanced the carving. 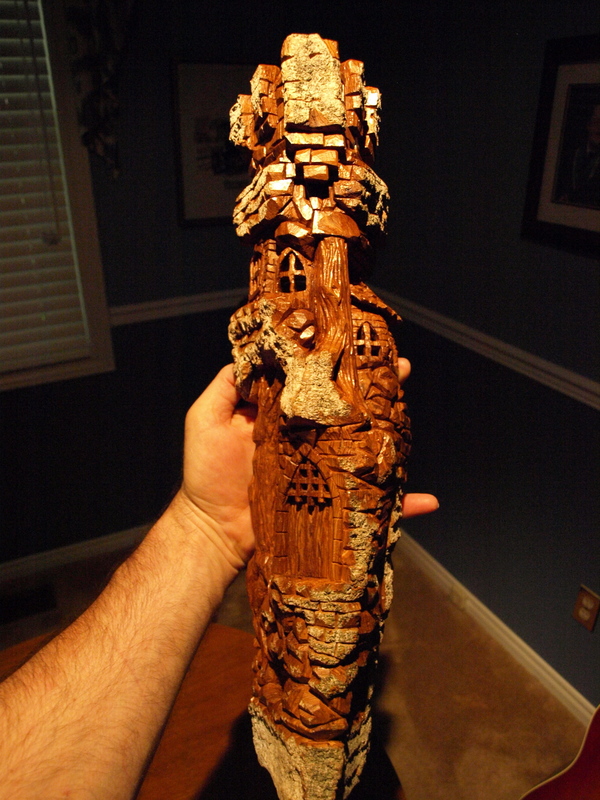 When it was finished, I gave it one light coat of satin urethane on the carved sections, which tends to darken things up and left the bark natural. I hadn’t realized that Cottonwood is in the Poplar family of trees although the size of the tree and the coarseness of the bark is definitely different than any of the Poplars that I’ve seen in Ontario. The castle is now finished! My Dad would have got a kick out of this carving. About 25 years ago I gave my Dad a carving for Father’s Day and here we are on Father’s Day again and I’ve finished a carving for my daughter. I miss my Dad a lot and wish he was here to enjoy this hobby with me. You’ll notice a few additions from the last post on this carving. An additional tree has sprouted to hold up the castle turret. I’ve carved out some windows, a little waterfall that is filling the moat and added some interesting items like the roots on the one tree wrapping around some rocks. Just above the moat is a network of caves…perhaps, secret entrances to the castle! This carving will hang in my daughter’s new house by the end of this week. Had a nice piece of Cottonwood bark delivered to me the other day. 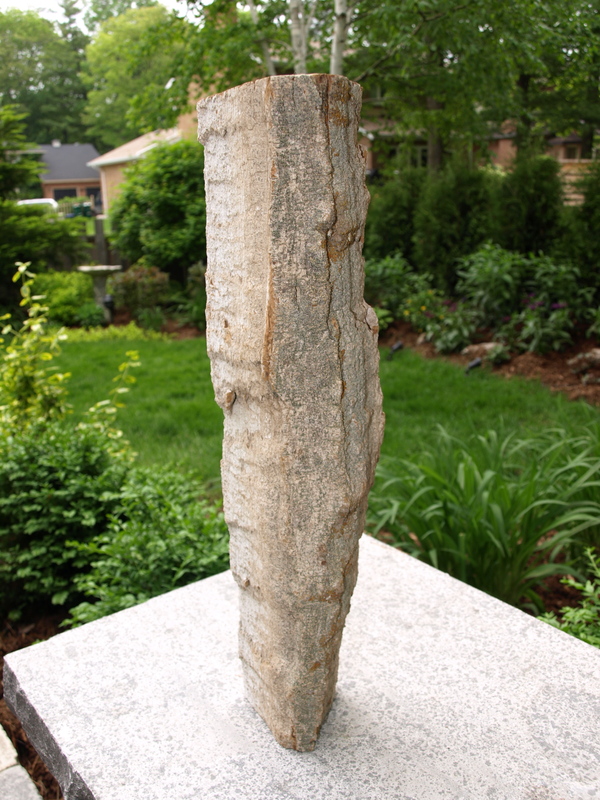 Once again, like the Cottonwood Mill that I carved earlier, the bark was generally white and light grey. This time, instead of being rounded in shape, it was much more angular and I had to take a few days to look at it to decide what it was going to be. I’ve been wanting to carve up another bark carving for my Mom and my Daughter ( Peggy kept the Cottonwood Mill and it’s already hanging on our wall ). As I looked at the wood, it felt like a castle of some sort was in there, and as my daughter is a big fan of “Game of Thrones”, the decision was made. Here’s the progress that I’ve made so far. Those trees on either side are “holding up” some part of the castle structure. They were particularly fun to do. I’ll be carving some caves at the bottom of the carving. The waterfall that I’ve left will feed a little moat. I have a few more photos on the Flickr Photos in my Links off to the right of this page.